Have You Filled Your Bucket Today? 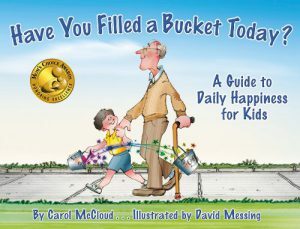 A Guide to Daily Happiness for Kids by Carol McCloud is an uplifting book that encourages positive behavior by using the concept of an invisible bucket. 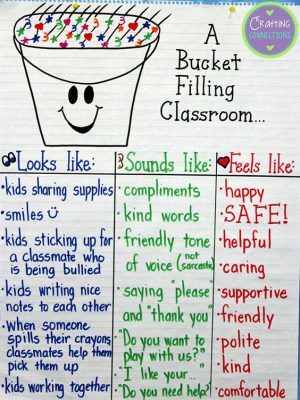 This is meant to teach children how easy and rewarding it is to express kindness, appreciation, and love by “filling buckets”. The story suggests that everyone has a bucket within us that needs to be filled with positive experiences, such as gratitude or praise. When our buckets are full, we are happy; when they are empty, we are sad. For example, people who “dip” into our bucket often take away happy feelings by refusing to help with a task or by saying or doing cruel things. When we’re negative toward others, we “tip” or “dump” others buckets and diminish their positive attitude, reinforcing the book’s premise to be positive and nice to others. “Bucket fillers” are those who help without being asked, give hugs and compliments, and generally spread their love and good feelings to others. The concept from this book can be used in classrooms to promote positivity and comradery among students. Moving and Choosing have a kit called “Have You Filled Your Bucket Today?” that includes two lesson plans, and an interactive activity incorporating healthy eating, active living and positive mental health. Both Lesson plans are designed to be incorporated into grades K-6. To borrow this resource, go to our positive mental health resource page. 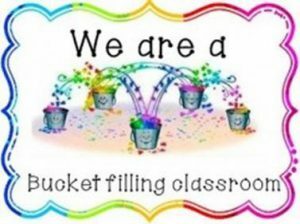 Another interactive activity is to have each student make a bucket. Having something tangible to see and touch, makes the activity more fun for students and allows them to put nice messages or complements in their classmates buckets. Learning and practicing positivity and kindness is important at every age and it is important to know that we can fill our own bucket and so can others; likewise, we can also dump our own or others buckets. Teachers can help students value themselves and each other when we encourage them to be helpful, compassionate, unselfish classmates.